You know how some games are so simple with their task-management type of gameplay, but they can become so frustrating and yet so addictive? Fast Food Panic is just like that. Let me explain. 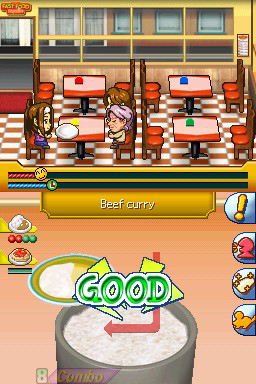 In Fast Food Panic you run a restaurant as Ken and Megumi. Their dream is to eventually have the best restaurant in the world and serve the tastiest food around. Your job is to help them out on their road to fame with your speedy and accurate stylus skills. 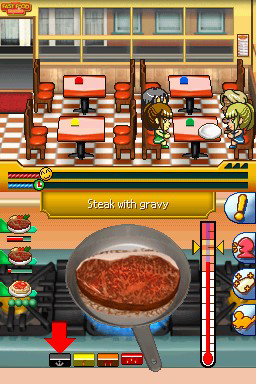 For comparison reasons, the game borrows some Cooking Mama mechanics with Diner Dash elements and plays similarly to Order Up. The main task is to prepare and cook each dish, but there are other tasks involved such as greeting customers, cleaning tables and shooing the mice away. Occasionally, there will also be "Help me!" stages with mini-games like directing Ken on a delivery avoiding road blocks, sorting dishes, glasses and cutlery in the right bins, scrub stains or punch some numbers in a calculator. You can play in Story Mode or Free Mode, in one of three difficulty levels. Story Mode is divided in stages that become progressively more complicated. 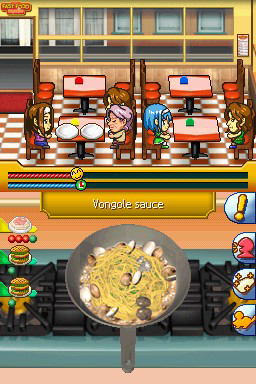 In Free Mode you can get your quick fix of cooking and serving by playing a quick round, since you can pick and play any stage that you have unlocked in Story Mode. 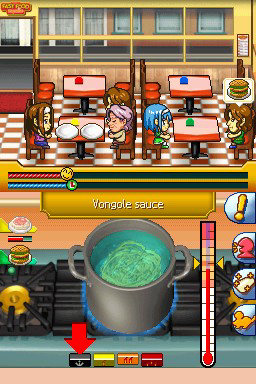 You will be serving pizza, pasta, steaks, stew, sushi and hamburgers all around the world. 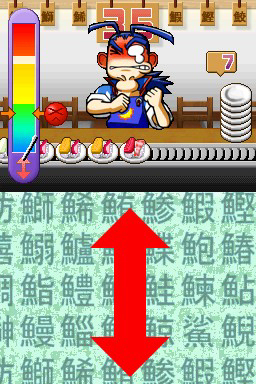 The order queue appears on the left side of the touch screen, with dots indicating the steps required to complete the dish and a bar for the cooking progress (this I eventually noticed on my own, there is no indication about it in the manual). Each dish varies in complexity and prep time, so when you have several orders at once, it's good to prioritize tasks and synchronize cooking times. You will begin by learning how to make sushi: scoop the rice twice, then trim the extra bits, then memorize the pieces you want and drag them to the rice. For a hamburger, you select and drag the pieces to stack them in the right order. 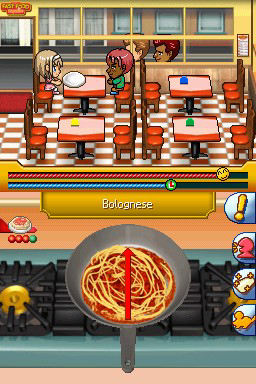 Pasta is done by preparing the sauce, cooking the spaghetti, then mixing both. For steak, you cut the meat, tenderize it, fry it and make the sauce. 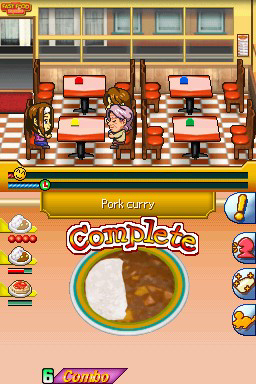 To make curry, you add the main ingredient to the pot, heat it up, scoop the rice onto the plate, then pour the curry on it. My favorite dish to make was pizza, where you roll the dough top to bottom and then side to side, drag the ingredients onto it, bake and cut it into slices. All the movements require simple drag or tap motions, repetitive tapping for tenderizing and chopping, circular motions for mixing. Nothing overly complicated, but some actions didn't seem to respond as well as others. In the Mini-games Mode you will be able to play 9 extra mini-games that are unlocked as you play through the Story Mode (although you don't get any indication that you have unlocked a new mini-game, so keep checking as you clear different stages). These offer short and fun distractions from the hectic pace of cooking for a room full of hungry customers and critics. 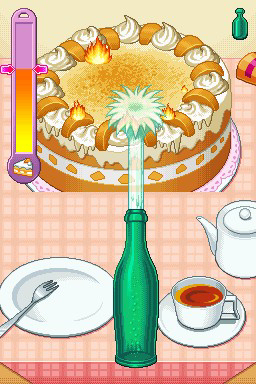 These tasks include fishing, speed eating, putting out a fire on a birthday cake with a soda bottle, digging for truffles by "triangulating" with pigs, food delivery without retracing steps, rhythm food serving, sauce decorations, stacking burgers, avoiding a spicy dish from a series of rotating ones, and making pizzas. As for the controls, you will soon realize that repeating them extremely fast won't work. There is a certain pace for certain movements (using the meat grinder and rolling pizza dough, for example) and you will soon find out that it's not so much the speed that counts, but the accuracy. Special thanks to Edith Yang and SouthPeak for providing a copy of this title.